Ultra Music Festival recently revealed phase one of the DJ and Live line-up for its 16th edition in Miami, March 2014.Rounding off what has been a big year, one that saw it roll out a memorable double weekender for its 15th anniversary in Miami, international editions in Argentina, Chile, Ibiza, Korea and Croatia, and announce new Ultra destinations in South Africa and Japan for 2014, focus for now turns to the prized flagship! Above & Beyond, Afrojack, Alesso, Armin van Buuren, Avicii, Carl Cox, Cirez D, David Guetta, Diplo, Hardwell, Kaskade, Krewella, Loco Dice, Luciano, Marco Carola, New World Punx, Nicky Romero, Solomun, Steve Angello, Tiësto and Zedd are just some of the headline acts that will lead the annual pilgrimage to Bayfront Park, downtown Miami. Gracing the Live stage will be front runners including 2 Many DJs Live, Basement Jaxx Live, Chase And Status, Cut/Copy, Dizzee Rascal, Empire Of The Sun, Eric Prydz Presents ‘Holo,’ Example, Gesaffelstein Live, The Glitch Mob, Mgmt, M.I.A., Netsky Live, Paul Kalkbrenner, Pusha T, Trentemøller and Sub Focus Live. 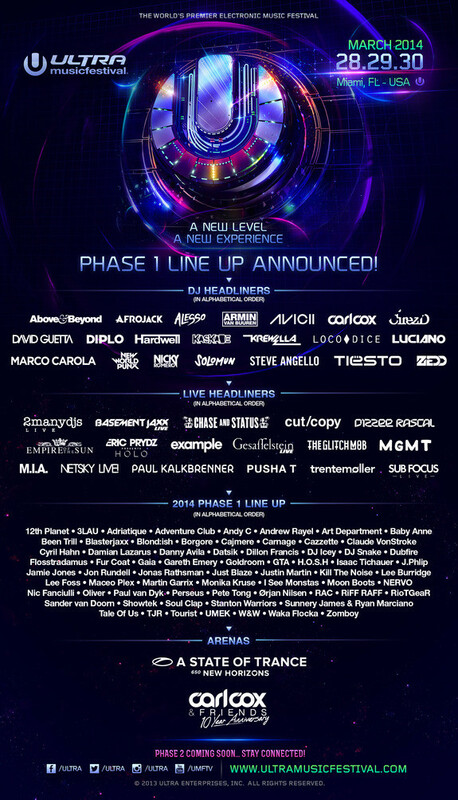 Over 40 acts from the phase one billing are those making their Ultra debut appearances. DJ headliners descending upon Ultra’s ocean front location for the first time ever will be New World Punx And Solomun, as well as a large proportion of the live headline billing such as Basement Jaxx Live, Dizzee Rascal, Eric Prydz Presents ‘Holo,’ Example, Gesaffelstein Live, Mgmt, M.I.A., Monika Kruse, Paul Kalkbrenner And Pusha T. Support Debut Acts Include 3lau, Adriatique, Andrew Rayel, Been Trill, Blasterjaxx, Blond:Ish, Cyril Hahn, Dj Snake, Gaia, Goldroom, Gta, H.O.S.H, Isaac Tichauer, Jonas Rathsman, Just Blaze, Martin Garrix, I See Monstas, Moon Boots, Oliver, Perseus, Ørjan Nilsen, Rac, Riff Raff, Tale Of Us, Tjr, Tourist, Wacka Flacka and ZombOY.